Here's an intermediate design for a 2'x4' Cornstock Banner. The final colors will be deeper and richer... nothing like the "circus colors" depicted. ...will there be real corn playing instruments or, like, people in costumes? 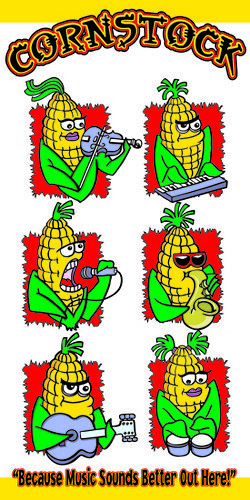 UNFORTUNATELY, no actual corn playing instruments. FORTUNATELY, no people in costumes (I hope).